For lovers of nature, this beautiful wedding ring features exquisite leaf-like detailing and diamonds for a more individual and striking piece. 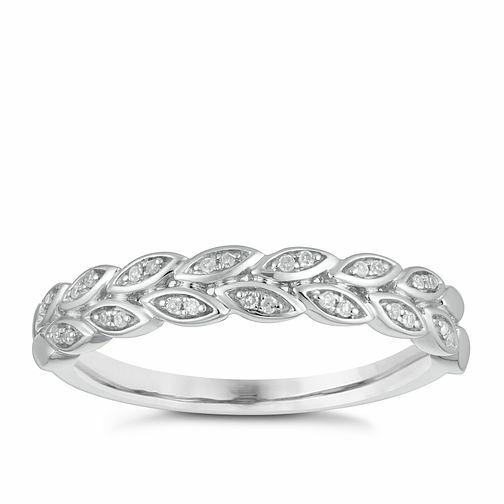 9ct White Gold Diamond Leaf Wedding Ring is rated 5.0 out of 5 by 2. Rated 5 out of 5 by Anonymous from Just what I wanted! This ring is perfect. I ordered a few rings from Ernest Jones and other retailers to find my perfect wedding band. This one stood out by far. It’s strong and sturdy whilst still looking pretty and dainty. I love the design and how it’s a little different. Really good value for money I cannot wait to wear it next year!